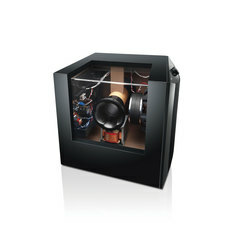 Introducing the completely and beautifully evolved Yamaha premium subwoofer. Delivering uncompromised performance and preserving every detail, the NS-SW1000 adds dramatic richness to your audiophile grade audio system. Reminiscent of a Yamaha grand piano, the gloss black finish adds a touch of elegance to any living space. 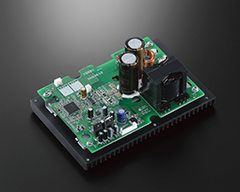 The NS-SW1000 is powered with a 1,000 watt digital amplifier featuring the all-new Yamaha DP200 digital amplifier IC and a high current MOSFET discrete push-pull output stage. Meticulous sound tuning includes the use of a luxurious triple-wound litz wire, high-capacity output coil and capacitors designed for high performance audio. 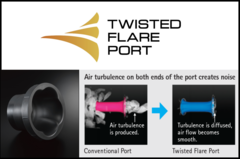 The Twisted Flare Port takes advantage of extensive subwoofer development experience. The flared, gently twisting shape diffuses the vortex of air generated around the edge of the port, creating a smooth flow of air. 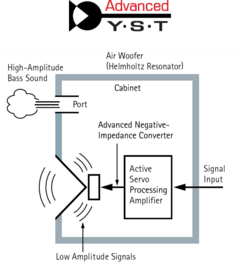 This reduces extraneous noise not present in the original input signal and provides clear, accurate low frequency. Thanks to excellence in woodworking, Yamaha designed the cabinet of the NS-SW1000 with three-way mitered construction joints. This technique ensures extremely tight joints so the entire cabinet behaves as a single unit, providing tight, powerful and accurate bass reproduction. The cabinet employs a heavy bass reflex enclosure constructed of thick 36 mm MDF (medium-density fiberboard) on the baffle sides and 25 mm MDF on the other sides. The strong anti-resonant structure with cast-iron legs and a front-firing woofer deliver uncompromised sound perfect for any high-end audio system. 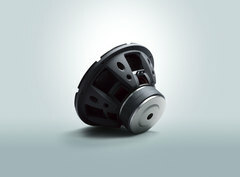 The specially designed woofer diaphragm is semi-pressed paper incorporating Kevlar fibers for strength and optimal internal losses. Developed specifically for this model for peak performance. For accurate bass response, the NS-SW1000 features Advanced Yamaha Active Servo Technology II. This proprietary technology dynamically compensates for the negative effects of speaker impedance to maintain excellent control and perfect linearity for superior sound quality. 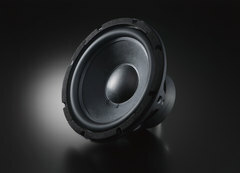 To achieve long-stroke drive with its superior linearity, the NS-SW1000 uses a 12" woofer unit with a strong, flexible drive system employing two stacked large diameter ferrite magnets and a double damper with an air vent. The frame is high strength aluminum die cast to suppress unwanted resonance even at high volume, making it possible to reproduce delicate tonal nuances. The system control terminal can be linked to the amplifier power to automatically turn the power on and off. There is also an Auto Standby Function: if no signal is input from the amplifier for a fixed period, it automatically switches to the standby state, and when a signal from the amplifier is detected, power turns on automatically.